We’d been performing poetry together for about a year when we added some of Kim’s original songs (and the odd cover) to the mix. 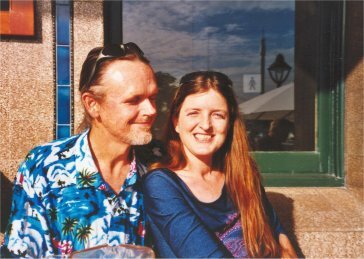 In 1994, we toured the USA with The Ozpoets troupe, (Australian poets Dennis Woodley, Pamela Sidney, Grant Alexander McCracken, John Beaton, and Alex Mellor from the UK) and, during that tour, Kim and I began pairing our poems into what eventually became the ‘Fit of Passion’ show. This song was written by Kim Downs, sometime in the 1980s, about the border between San Diego and Tijuana, a youthful stomping ground. Sadly, it is still as relevant as when it was written, and references the practices of Colonialism as the root of much suffering and inequality. Performed Live by ‘Fit of Passion’ (Kim Downs and Liz Hall) in Rogers, Arkansas, 1994 at The Hickory House. Camera by Wayburn Downs. Set by Grant McCracken. Lyrics below. And don’t you dare look South at what it means.